Getting married abroad is not an option for everyone, or even a consideration. I myself would more than likely choose to get married at home here in Ireland - but every so often you hear a story or see a photograph of a couple who have eloped and it makes you dream of what could be! My parents got married in Rome in the early 70's - the few photographs we have are incredible, with St Paul's Cathedral providing the backdrop for the day. My father looks like he could have been a member of The Beatles, and my mother looking up at him adoringly. Even though it was completely foreign to them, they look so natural in the environment. 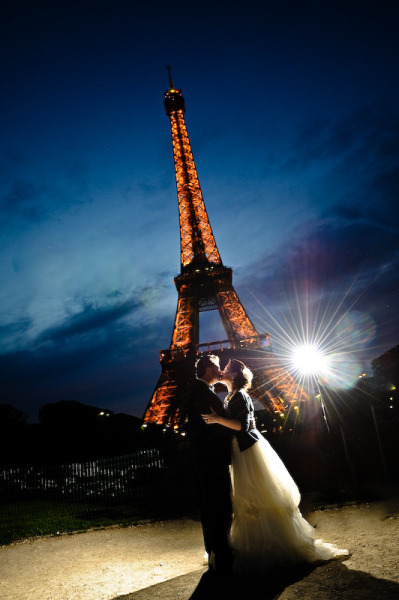 Recently I came across a story of an American couple who eloped to Paris on a whim. I have a huge soft spot for Paris and so not surprisingly it inspired this blog entry. If you choose to get married abroad, there may be a lot of legal requirements that you need to sort through firstly. Contact the embassy of the country you are choosing to get married in to find out what you need - you may require a Certificate of Freedom to Marry; or you may need to be legally married in your own country prior to travelling abroad. In some cases, as in Ireland, your marriage will be registered in the country in which you are married. The certificate of marriage will be legally recognized in Ireland but may need to be translated. Holding your wedding abroad could be a dream come true - but you also need to decide if it just you and your partner who wish to elope, perhaps with 2 close friends or relatives as witnesses; or you might to decide to hold an entire wedding party there, inviting a larger number of guests. Remember that your guests will have to pay for flights, accommodation and take time off work/organise childminding, so give them plenty of notice.